Design is in the details, and at Sign Bracket Store, we have all the details necessary to make your signage an outstanding reflection of you and your business. Adding a post base, sign base, or more commonly known as an architectural aluminum post base creates distinction and style to a mundane post and sign. Taking its cues from history, a post base or sign base was used to cover the transition of the post emerging from the ground to add elegance and charm to what would otherwise be a plain old post and sign. Sign Bracket Stores assortment of cast aluminum bases are available in several heights, and we have post bases available for a 3 or 4 inch diameter post. Add a touch of class and style to way finding, street signage, or a company sign with a post base, sign base, or architectural aluminum base from Sign Bracket Store. Adding charm and grace to your sign posts, way finding, and lamp posts can be done easily with Sign Bracket Storeâ€™s selection of post bases, sign bases, or architectural aluminum post bases. Our post bases and sign bases are fabricated using cast aluminum. Cast aluminum is an extremely durable, yet light weight metal. Our post bases and sign bases are made by pouring molten aluminum into a mold in one of the assorted shapes we offer. The aluminum architectural bases then undergo substantial amounts of pressure, which produces an extremely dense material that will stand up to years of wear and tear. Our sign bases are then powder-coated black for extra protection, and will never rust. Adding a post base or sign elevates your signage or lamp post to the next level, creating an attractive and professional reflection of you, your business, or your city. 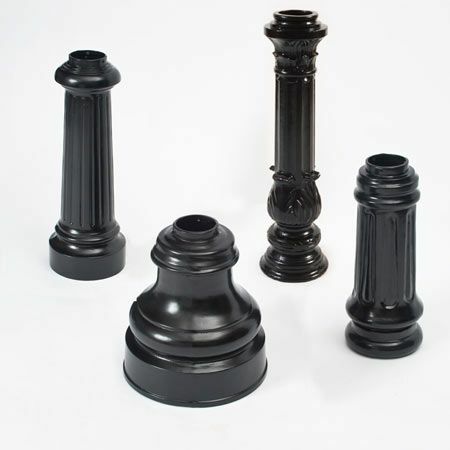 Our post bases and sign bases come in a variety of shapes, sizes and heights, and are available for a 3â€ diameter post, or a 4â€ diameter post. Sign Bracket Storeâ€™s post bases, sign bases, and architectural aluminum bases can be installed easily, simply slip the cast base over a 3â€ or 4â€ diameter post, adjust in place, and secure with the provided set screws. For extremely tall posts, we can custom make many of the styles we offer in a clam shell option, which eliminates slipping the post base over from the top of a post. Our post bases and sign bases can be special ordered unfinished as well, allowing you to powder-coat or paint to your exact specifications.